It’s November already! How the hell did that happen? I mean, wasn’t it just the fourth of July like a week ago? I can’t believe the holiday season is just around the corner! The next time you blink you’ll be in the middle of a flurry of day-long cooking, hair-pulling, holiday stress… er… fun, before sitting down at the Thanksgiving table and enjoying a feast with your loved ones. It goes by so quickly that sometimes it’s hard to slow down and remember to actually be deeply thankful for all that we have. It’s so easy to get wrapped up in the trials and tribulations of day-to-day life that you forget to stop and smell the roses, to appreciate the changing colors of the leaves or the glory of an icicle. Alright – you caught me. I’m spending the year on the coast in Puerto Rico, there are no leaves changing and a zero percent chance of snow that might form into an icicle. But I am thankful to have the opportunity to live in such an amazingly beautiful place and be surrounded by the welcoming arms of a genuinely warm culture. Where ever you are in your life or whatever your circumstances maybe, there are always things to be thankful for. While I think we should find the glory and appreciation for these things everyday, it’s nice to have a holiday that brings us all together so that we can share in our thanks outwardly and uplift each other. Having a food blog means testing recipes for holidays WAY in advance. Sometimes there are recipes that you develop that you like, some that you can’t stand, and others that you flat out love. This Thanksgiving recipe that I developed for Knorr using their Homestyle Chicken Stock falls into the love category! Have you ever cooked your wild rice in orange juice before? It give it a sweetness and glazes the rice as it reduces and is absorbed. 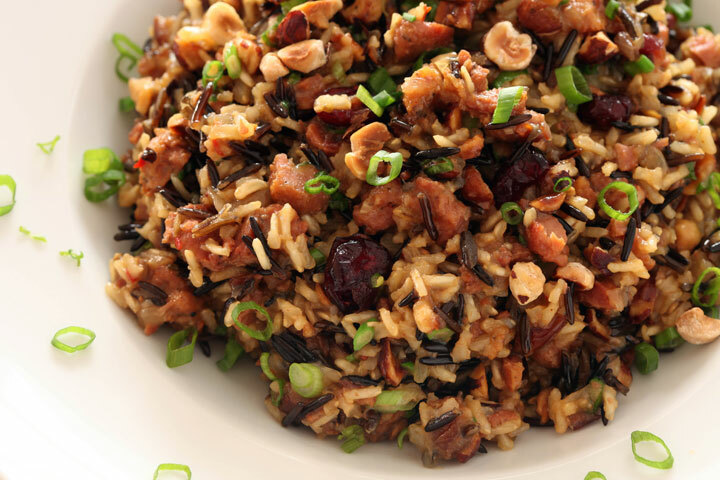 The dried cranberries add to the whole sweet-tart profile of the dish, while the fennel bulb and seeds play off the savory hot Italian sausage side. Really – I’m gonna go out on a limb here and say I might not miss stuffing on the Thanksgiving day table if this wild rice dressing were present. Okay, that might be a load of BS because I love stuffing, but this was sooooooo delicious. Good enough that over the course of two days my roommate and I polished off all ten portions and were sad when the last grain of rice was gone. Have you planned out your Thanksgiving dishes yet? Do you try out the recipes in advance or just wing it and hope it all goes well the day of? I’d love to hear what you guys have lined up! Reduce heat to medium then place pan back over heat. Add canola oil to the pan and heat for 1 minute. Add yellow onions and fennel to the pan. Saute over medium heat until onions are translucent, stirring occasionally, about 10 minutes. Add garlic and fennel seeds to the pan. Stir and cook for 1 minute until aroma of garlic is released. Add Knorr Homestyle chicken stock, orange juice, water, kosher salt, and black pepper to the pot. Stir and raise heat to high. Bring liquid to a boil. Add wild rice, dried cranberries & browned sausage. Stir. Allow ingredients to return to a boil then place pot into the preheated 350 degree oven. Bake rice, uncovered without stirring until liquid has been absorbed and rice is tender yet not mushy, about 55-65 minutes. Remove from oven, fluff with a fork then stir in toasted hazelnuts and green onions. Serve immediately. If desired, garnish serving dish with a few extra sliced green onions. This is great! I’ve never actually tried to do a rice dressing. Love the cranberries and hazelnuts in there! Oh wow Amanda, that looks amazing! I bet that aroma filled your home with comfort! yum! thanks rubes – seriously it was AMAZING! LOL cookie! i wish we hadn’t eaten it all! it’s so good i would have driven some up to you and jenny! ps – when i’m not broke (aka december) i swear i’m going to have you two over for dinner! i’ll fb message you for dates! I’m bookmarking — this is a definite contender for our Thanksgiving table! Looks delicious! You had me at Italian Sausage. Bizarre – with the exception of the Knorr stock (I’ve always got lots of stock in the freezer), this is amazingly similar to the dressing I’ve come up with for stuffing anything that wants stuffing – more usually buttercup squash. I came to it out of a desire to keep hubby pain-free by avoiding gluten, and I can’t believe it satisfies this starch queen every bit as much as traditional stuffing. For a cheap everyday version, it works with apples, raisins, coriander and walnuts (or toasted sunflower seeds, added at the end), rather than cranberries/hazelnuts. But definitely pull out all the stops and follow this to the letter for a really special meal. Thanks! Where did this year fly off to? I swear last I checked it was July! I actually have cooked rice in orange juice before (sweet rice pudding, so completely different)… and apple cider juice… but this looks delicious! With a little chopped butternut squash and raisins, I would definitely make this for Thanksgiving! This looks delicious! I’m Canadian and we’ve already celebrated Thanksgiving, but after reading all these Thanksgiving-inspired recipes and looking at all these delicious photos, I feel like I need to celebrate American Thanksgiving anyways. That looks really delicious. I’d love to try it. I’ve never tried a combination brown rice/wild rice in a recipie before. I know this is sponsored by Knorr but have you looked at the ingredients in their ‘homestyle’ stock?!?! Absolute crap! I will not use this stuff. The recipe, minus the ‘stock’ looks good though.